Shire is expected to unveil a new disease awareness campaign Thursday featuring actress Jennifer Aniston as it prepares to introduce its new dry-eye drug to the U.S. market. The drugmaker expects the multi-channel initiative to lay its foundation in the ophthalmology market, following the approval in July of its chronic dry eye drug, Xiidra. The campaign will also set the stage for Shire to compete with the current market leader, Allergan's Restasis. Xiidra is expected to be available in pharmacies later this month. This is the rare-disease maker's first move into the eye care market and its CEO Flemming Ørnskov told investors during the company's earnings call earlier this month that he considers the launch of Xiidra to be the company's biggest to date. Xiidra represents a new venture from a drugmaker that bills itself as a global biotech focused on rare diseases — given the many millions of people affected by dry-eye disease. "Shire is making a big entry into the eye care space at a time when there's a little bit of churn within the leadership [of the category]," said Vic Noble, head of marketing, ophthalmics, for Shire. "This is what market leaders, and want-to-be market leaders, do — they show a big commitment to health." The company is indeed making a big commitment, pulling in TV and movie star Jennifer Aniston as the face of the campaign. She will be featured in TV spots for eyelove and will also be involved in consumer PR outreach. Shire hired Digitas Health LifeBrands as the creative agency for campaign, and Edelman is leading social media, experiential events, and consumer PR. Shire is the latest company to recruit A-list celebrities as part of its marketing efforts, in part because drugmakers view respected celebrities as a way to break down stigmas and drive awareness around disease states and new products. 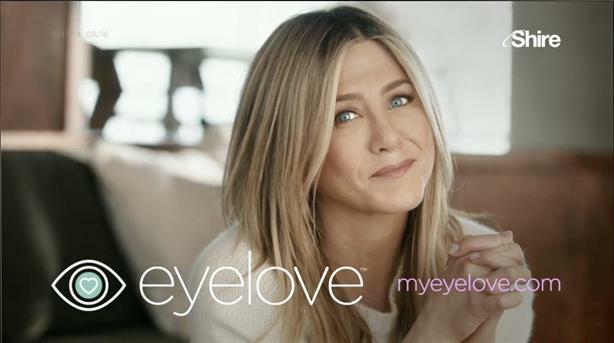 The company plans to use Aniston to encourage people to make their eye health a priority and raise awareness and understanding about chronic dry eye symptoms among women. Allergan, too, recently employed the use of some high profile celebrity names, including TV and stage star Lea Michele, movie star Kate Bosworth, and reality-TV personality Khloé Kardashian. Mylan in May launched a campaign with actress Sarah Jessica Parker to start conversations around its emergency allergy treatment, EpiPen, which has recently come under fire from lawmakers over its price. "We picked up a magazine and there was a story about Jennifer [Aniston] and she mentioned that she's addicted to eye drops," Noble said. A few phone calls later and she was on board, Noble noted, adding that "this is an issue she's been dealing with for a while." Noble described the campaign as a storytelling platform that will encourage consumers to adopt phrases like "eyelove knitting," a play on "I love knitting." The campaign targets women because they are at greater risk of dry eyes than men, and that they "are the gatekeepers of the family," she pointed out. "They're easily activated and mobilized, this is a big campaign, we wanted to mobilize as many people as possible. We know that empowering this female segment will cascade into other segments." Women make 94% of their own healthcare decisions and 59% of medical decisions for others, according to research conducted by the Center for Talent Innovation, which studies global talent issues. The campaign will also include online videos featured on social media, including Facebook, Twitter, and YouTube, as well as on the streaming service Hulu. In addition, the team developed an animated video titled The Skinny on Chronic Dry Eye, which is meant to help consumers better understand the disease. Shire also plans to include a number of live events to promote the campaign. The first will be a two-day art installation on New York City's High Line to "celebrate the uniqueness and beauty of our eyes," Noble said. The eyelove art installation will travel to other venues over the next six to nine months. "Eyelove is about two imperatives for us," Noble said. "It's about promoting eye health and enabling women to do what they love to do and how these two things play off each other." As for the churn in the dry eye market, Xiidra's label has positioned the chronic dry eye treatment against Restasis, the market leader. Evercore ISI analyst Umer Raffat wrote in an investor note that Xiidra's label is "clearly better" in that the drug is approved to treat the signs and symptoms of dry eye. Restasis treats chronic dry eye by increasing the eye's ability to produce tears. Xiidra's approval makes it the first new drug in the category since Restasis' approval in 2010. Restasis brought in U.S. sales of $298 million in the second quarter of 2016, and just short of $1 billion in 2015. Market research firm Global Data has predicted that the market for chronic dry eye treatments could reach $4.6 billion by 2024. Raffat, too, believes that Xiidra could grow the market overall. Nearly five million Americans who are 50 years of age and older are estimated to have dry eye. Shire believes that broader patient population is much larger, that there are an estimated 16 million patients in the U.S. alone who are diagnosed with dry eye disease. Allergan has been preparing for the competition. Its chief commercial officer, Bill Meury, said during an earnings call in August that they expect growth for Restasis to "moderate" with the introduction of Xiidra, as well as the fact that "Shire is going to, of course, be sampling the product heavily." He also said that Allergan has increased its sales force in ophthalmology by 20%, adding 60 more sales reps, in addition to increasing its investment in direct-to-consumer advertising to help preserve market share. The company is also looking to make changes to Restasis with the introduction of a multi-dose preservative-free bottle, although that effort was delayed due to Allergan receiving a complete response letter (CRL) in March for the new container from the FDA, which requested more information. The bottle is expected to make the drug easier to administer. Allergan remains bullish on Restasis, however. "We can maintain growth for this business over the long term, even if there's a moderation for a couple quarters," Meury told investors.